The Bundesanstalt für Immobilienaufgaben (BImA) is, with a portfolio of more than 400,000 ha and about 44,000 apartments, one of the largest real estate holders in Germany. Along with the sale and leasing of residential and commercial space, there are also areas for maintaining renewable energies such as decommissioned airports or former fuel parks in the portfolio. About 6,000 persons work for the company in nine regions at 120 sites. 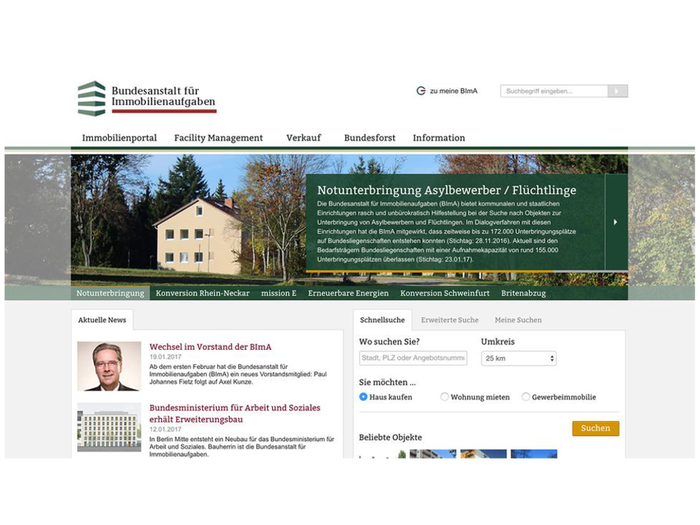 So that editors and partners of BlmA throughout Germany have the opportunity to conveniently and quickly develop websites, they use the processing concept from Infopark's Content Management System. Effective multisite management, the intuitively designed graphic user interface and the high level of prefabrication through the building block system make for a centralized and comprehensible editorial system. with the innovative inline-editing concept, content boxes can be inserted with two clicks. Editors can set up and complete new campaigns, micro-sites and conversion sites in no time at all. Along with the technical implementation Infopark is also responsible for the design. With the adaptable and programmable platform in the cloud, websites are set up with the click of a button. By setting up a new website using the multi-site management console, the website is completely functional with search, navigation and pre-filled areas such as "Data protection" and "Imprint". Using an interface with "ImmobilienScout24", those searching for real estate receive all the BlmA offers filtered for their needs in the completely integrated real estate portal at www.bundesimmobilien.de - in real time. Didn't find the right real estate? Upon request, interested parties receive a message immediately when new offers appear that match their query. Several thousand recipients are informed every day within just a few hours via a personalized e-mail. The "Meine BImA" portal allows the user to independently adjust their master data and queries for the real estate agents as well as to administer the newsletter subscription.